The state government has been under fire over the death of the tigress, officially known as T1. 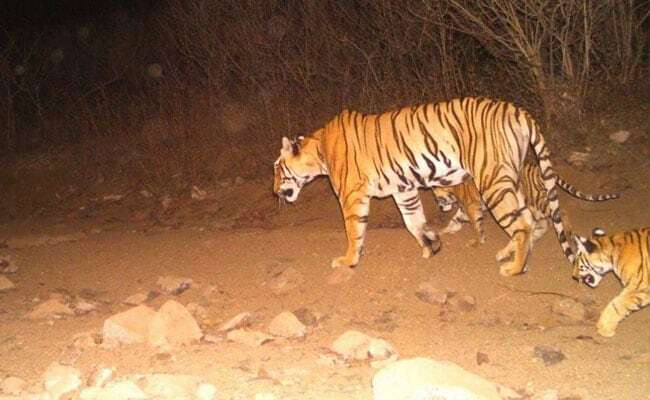 The final report of the National Tiger Conservation Authority's (NTCA) fact-finding committee has raised questions over the way tigress Avni was killed in Maharashtra last month. The committee said there was no operational coordination among veterinary professionals and the team which killed the tigress on November 2 in Yavatmal and that the dart for tranquilizing the feline was fired unauthorisedly. It also said the veterinary drugs were handled by unauthorised person during the operation, in which sharp-shooter Asghar Ali Khan had shot the tigress. The state government has been under fire over the death of the tigress, officially known as T1, who was believed to have turned a man-eater and killed 13 people in the last two years in Yavatmal. The killing of the tigress also led to an outrage among animal lovers and wildlife organisations. The two-member committee, comprising retired additional principal conservator of forests O P Kaler and NGO Wildlife Trust of India's deputy director Jose Louies, was constituted on November 8 to probe the tigress' killing. The report was submitted by the committee to member secretary, NTCA, on November 28. The committee in its report stated that the forest department took creditable efforts for tracking, camera trapping and DNA analysis to identify the suspected animal and placed trap cages to capture T1 alive. "However, there was no operational coordination among veterinary professionals and the team which killed T-1," it said. Also, forester Mukhbir Sheikh was authorised only to identify the tigress or her cubs. The dart fired by Sheikh was used approximately 56 hours after being prepared by a veterinarian expert, who had advised Sheikh to use the dart in his presence and within 24 hours, the report said. "Neither Mukhbir Sheikh or Asghar Ali Khan cared for the expert's advice," the report said, adding that the dart was fired at T1 without adequate preparedness and the NTCA's standard operating procedure was not followed. It said the dart was fired from approximately 12.8 m distance when T1 was on its natural path crossing a road, probably moving towards a nullah (drain). The tigress continued movement after darting on its natural path while snarling and growling at the team probably because of disturbance due to the dart, moving vehicle and light. "Within three to five seconds, Asghar Ali Khan took one of the guns and shot at T1 from the moving vehicle in sitting position. T1 was stunned by the impact and died on the spot," the report said. The report said evidences collated from the site, videos taken soon after the incident and recreation of events strongly support these observations. "In view of the facts emerging out from the provisional postmortem report, the firing in self-defence is doubtful," it said. The report findings further state that the weapon used by Asghar Ali Khan to fire at T1 was licensed in the name of his father Shafat Ali Khan, who was not present with the team that shot the tigress. Asghar Ali Khan has not produced any authorisation from his father to use the gun in his absence, and he used the "unauthorised weapon" to eliminate T1, the report said. Besides, the delegation of powers vested under Section 11(1) (a) of the Wildlife (Protection) Act 1972 by the Chief Wildlife Warden to CCF (T) and authorisation of person by CCF (T), Yavatmal to capture or eliminate tiger (Schedule I species) is violation of Section 5 (2) of the said Act. The ballistic report, forensic report and other lab reports along with final postmortem report are necessary evidences to further corroborate the findings of the report, it added.